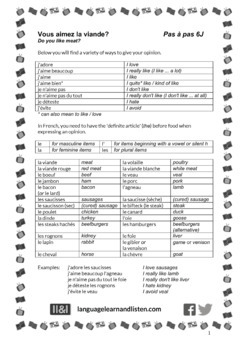 In this worksheet you will find a wide variety of ways to give your opinion about a range of meat and poultry. It demonstrates the need to use the definite article (le/la/l'/les) before the noun. There are 2 exercises (French to English and English to French) and all necessary vocabulary is provided. Suitable for all levels of ability. Answers provided.